As anyone who's looked at my "Read" bookshelf will be aware, I really, really like Steven Erikson's Malazan series. I've had his collaborator's book on my shelf for a long time unread because I was afraid of disappointment. I'm happy to say that I wasn't. I wish we had half-stars or more stars to rate these books because this one is really a 3.5, an 8 on a scale of 10. 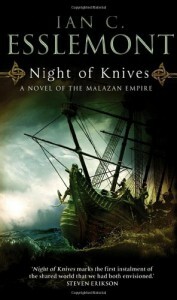 Esslemont doesn't write with the easy confidence or skill that Erikson exhibits but he does write well; and (unlike Erikson in his one arguable fault) he writes concisely -- Night of Knives comes in at less than 300 pages in the UK edition I have, and it's fairly large type. The most interesting character, in my opinion, was Temper but considering the ending I don't know if we'll be seeing more of him. Hopefully, Esslemont will find a compelling character(s) to anchor future volumes. I'm not so nervous about the appearance of The Return of the Crimson Guard this August.